14K white and yellow gold,0.3000ctw diamond ring. GIA certificate. Command vibrant style. Crafted from 14K yellow and white gold, this ring displays one round full cut diamond 0.3000 in channel settings. 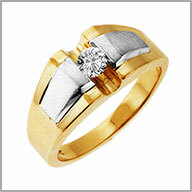 The wide, polished band has ridged accents in hight polish 14K yellow gold and brush satin in white 14k gold. An undergallery makes for a comfortable fit. The diamond weight is 0.3000ct (approximate)The diamond color is F and VS2 in clarity The ring measures 3/4"L x 7/16"W x 3/8"H.